The Active Eight NZ Reunion Committee have arranged a comprehensive 20 day tour of both Islands of New Zealand for our members, family and friends. The tour is split in the middle to allow our ANZAC Day march to be held in Wellington with our New Zealand members. The tour includes all accommodation on a twin share basis with private facilities and touring in a comfortable, air conditioned coach. There are also arrangements for member to attend only portion of the tour, i.e. South Island and reunion only, reunion only or North Island and reunion only. Meals include 19 cooked breakfasts and 16 three or four course Table d’hotel buffet, or speciality dinners. All entry fees to the various attractions are included. Your committee has worked to ensure that the very best of this picturesque country will be visited. Our New Zealand member and several seasoned New Zealand travellers have vetted the itinerary and agree that it would be hard to beat at the price negotiated; nobody else has come close to our deal with the tour company. The entire tour of 20 days, including our ANZAC Day march in Wellington is $3,245 per person and an extra $945 per person single supplement. twin share for 3 weeks touring New Zealand with your mates! Cost for South Island and Wellington is $2,110 per person and an extra $610 per person single supplement. Cost for Wellington and the North Island is $1,460 per person and an extra $435 per person single supplement. However, with regard to our reunion in Wellington, it must be realised that this price involves accommodation, meals and use of the coach only as details of the march have not yet been finalized. There might be change in meal arrangements depending on what is planned for us in Wellington. It does NOT include costs of the activities being organised by our Kiwi members. Such costings will not be available for some time. A little short of funds? Why not pay the deposit and then send our Secretary/Treasurer an occasional instalment when you can afford it? All your payments will be credited to you against the final cost of your tour. Unfortunately your committee could not arrange air fare discounts because we are spread around Australia and many members wished to use their frequent flyer points or leave from different Capital Cities. So airfares are NOT included. Private arrangements will have to be made in order to meet in Christchurch on 13 April. PERTH REUNION April 2010 The Active Eight spent Anzac week in Perth which turned out to be another great event for all those who attended. Coordinators Mick and Nita Howard, Paula Charpentier and Brenda Fitzgerald with other local members, put together a week of excellent entertainment including sightseeing, golf and cruises not to mention the fabulous dinners. 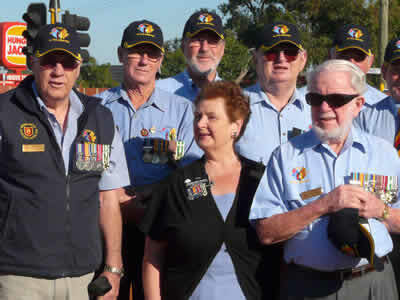 But best of all we were once again altogether, enjoying each others company as we have done for the past 22 years during Anzac week. New members who attended were; David Aspinal, Alan Stephens, Geoff and Avice Grace, Warren and Brenda Austin, Rob and Joan Miller, Rob and Jan Frencham, Clive and Cherryl Robartson and Bruce and Elaine Turnbull. Also making the big trip to Aussie were Margaret and Al Jupp all the way from New Zealand. Another to step out of the crowd was Ronnie Warren who we have not seen for many years. Click here to view the reunion gallery.